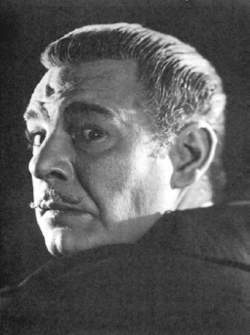 In Son of Dracula Lon Chaney Jr.’s vampire character was known as Count Alucard, which is Dracula spelled backwards. In his story “Carmilla”, author Sheridan Le Fanu assigned a unique characteristic to vampires: they must choose a name that, “if not his or her real one, should at least reproduce, without the omission or addition of a single letter, those, as we say, anagrammatically, which compose it.” Carmilla was originally named Millarca and was also known as Mircalla. This characteristic was unique to Le Fanu’s vampire. Although others have not employed Le Fanu’s stipulation concerning the vampire’s name, noted sequels to Dracula, the leading character frequently called himself Count (or Dr. or Mr.) “Alucard,” Dracula’s name spelled backward, such as in Son of Dracula (1943). Other variations of Dracula included Dr. Aluca, or, in the Dell Dracula comic book, Al U. Card. Le Fanu, Sheridan. “Carmilla.” 1872. Reprinted in Les Shepard, ed. The Dracula Book of Great Vampire Stories. New York: Jove, 1978: 15–99.